On Thursday we were disappointed, once again, to hear that Abby had lost 2 grams. Two grams is almost nothing, but it’s not a gain and it really confirmed that Abby was not making progress as we had hoped. After a disappointing day and lots of spit up, I sat and held Abby for a long time that night praying about what to do next. I got a couple of ideas, some new medicine that could be tried and maybe a different formula, which I talked over with our nurse. On the car ride home I spent more time praying and was very encouraged. I was pondering the “Why?” questions. You know, “Why is this happening to us?”, and “How can this possibly be for good?”. It’s not that I was asking those questions myself, but that I was realizing how it has never been a struggle to be since Abby’s birth. Though all the ups and downs of this season, I haven’t questioned that this is what God ordained and this is for the best. I went on to reflect that I really have been learning a lot and can see God building my character like the Bible says in Romans 5: “we rejoice in our sufferings, knowing that suffering produces endurance, and endurance produces character, and character produces hope, and hope does not put us to shame, because God’s love has been poured into our hearts through the Holy Spirit who has been given to us.” I thought about the many Christians who have had to learn some of the same lessons that I am, but by losing a child. How grateful I am that God is teaching us these things in a more merciful way, by not actually taking Abigail from us! The night ended with my having a very clear sense that God is carrying me and the feeling that I need to keep being carried by Him, no matter what comes next. The next morning I was remembering these lessons as we walked into St. Joe’s, the hospital where Abby was staying. Though we missed rounds, the doctor sought us out to talk and dropped a bombshell (as she put it). Abby had not gained weight again. She had lost 4 grams. Looking back over the past two weeks made it very clear that Abby had ceased making any forward progress and the doctors at St. Joe’s had essentially done all they could for her. There is a gastrointestinal (GI) specialist at the University of Michigan who could help, but we would have to transfer to Mott Children’s Hospital in Ann Arbor to be able to see him. So, it came about that our departure from St. Joe’s was not the happy one of a discharge, but the disappointing situation of a transport. 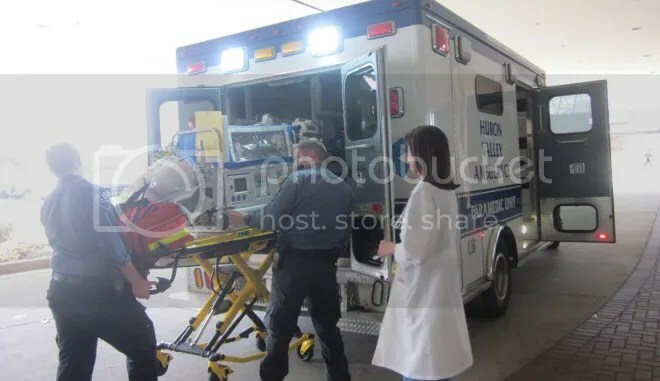 Dan took Lydia to work so I could stay with Abby all along, and I got to be with her as they loaded her into a transport isolette, wheeled her through the hospital and outside, and loaded her into the ambulance. I got to ride along in the front seat and come with her as she was resettled in her sixth bedspace so far, now at Motts. For the record, Abby enjoyed her first car ride. She slept the entire time, from being in her crib at St. Joe’s until her next feeding time in her crib at UofM. She didn’t open her eyes once during the whole trip, but squinted whenever the sun came in through the window (her first taste of sunlight, crazy to think). The first hour was very crazy with lots of new faces and lots of chaos as Abby was settled in and I got the grand tour. UofM gives patients all private rooms and nursing moms get three free meal orders a day. There’s a big playroom for healthy kiddos including a complete playground indoors. But even with those perks, it’s been a rough transition. You might think all NICUs work the same, but they don’t. Of course they are similar, but every NICU is run differently, and (as you might expect from the UofM) Mott’s is much less personal. There are also something like a million (exaggeration) neonatologists instead for the five we had at St. Joe’s. But that doesn’t matter too much because the resident is really the one making calls for Abby these days. However, we have always said that St. Joe’s is our preferred hospital unless our baby has something weird, in which case UofM would be better. There are more specialists and they have much more experience with the weird cases. And with Abby’s excessive spit up, she qualifies as having something weird. Abby did ok for the first feeding. Not a lot of spit up. Took the whole bottle. Went right to sleep. At her second feeding she spit up all over Dan. After she was finished and settled in her bed, she spit up again, and again, and again. The nurse came in to change all her clothes which only aggravated the situation and she ended up wrapping her in blankets and putting her back in the isolette (they had moved her to an open crib that morning). Abby is back on HMF (human milk fortifier), which is the very first fortifier she was on, because the doctors want to get a baseline for what works and doesn’t. We argued a little (we were very tired and worn out and maybe a little too forceful) asking if she could please be put on Nutramigen, because that’s the one that has worked out the best so far. The resident said they would observe her overnight and discuss a change in the morning. Dan and I understand and appreciate the reasons for Abby’s transfer. We are hoping the GI specialist will be able to get to the bottom of Abby’s issues, and that she’ll be able to come home soon. However, there’s a different attitude in the new hospital, less of a drive to get Abby home, which is hard for us as we thought she would be home two and a half weeks ago. Poor little Abby is showing the signs of her spit up. She is very skinny now and looks almost like she did as a newborn two months ago. (She is bigger, but now just as skinny) Dan says she looks a little better than that, mostly because she opens her eyes now. We are thankful that she is still bright eyes and energetic, but we think it’s likely that we will soon find Abby on an IV unless things turn around quickly. We trust and we know that God is still carrying us. He is working this all out for good. It was the greatest comfort to me to know that, as we left all of the familiarity of St. Joe’s, the same God went with us to UofM and will take care of us there. This entry was posted in Abigail Faith and tagged Abby, CS Mott Children's Hospital, GI, Neonatal intensive care unit, NICU, preemie, spitup by justeeni. Bookmark the permalink. Thanks for the update. Change isn’t always easy, but at least you know that Abby is being moved only because the doctors and nurses at St. Joe’s are big enough to admit they need help with her, and you are going to the very best! It’s so true..God has carried you and will continue to..you will see only one set of footprints! So many friends and family are praying for you…so hang in there; cling to our Father, and we will be eagerly waiting for the good news to come!! Love you all.